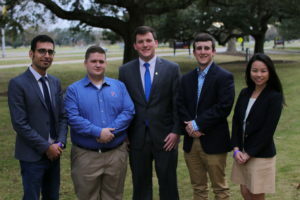 Five members of the Louisiana Tech University student chapter of the Institute of Industrial and Systems Engineers (IISE) and Dr. Jun-Ing Ker, program chair of industrial engineering at Louisiana Tech and the chapter faculty advisor, attended the IISE 2019 Southeast Regional Conference last week in Baton Rouge. Pictured are student conference attendees (from left) Ali Farahani, Alan Fulton, Sammy Monk, Josh Green, and Laura Halbrook. The students, Ali Farahani, doctoral student in computational analysis and modeling, Alan Fulton, vice president of the chapter and undergraduate industrial engineering student, Sammy Monk, chapter president and undergraduate industrial engineering student, Josh Green, chapter treasurer and undergraduate industrial engineering student, and Laura Halbrook, chapter secretary and undergraduate industrial engineering student, joined more than 140 students from across the Southeast United States to attend workshops and network. Following the “Leading the Fourth Industrial Revolution” theme,the students learned about “Industrial Cybersecurity and the Role IEs (industrial engineers) Play”, “How to Negotiate”, “IEs in Oil & Gas”, and “AI (artificial intelligence) in Healthcare”. They also attended a career fair and took a tour at the Intralox manufacturing plant in New Orleans. The IISE is the world’s largest professional society dedicated solely to the industrial and systems engineering profession. The organization provides leadership for the application, education, training, research and development of industrial and systems engineering. In addition to attending conferences, the Louisiana Tech chapter hosts industry speakers and schedules plant tours for professional development each quarter.